You've seen her on television with her husband, Dr. Phil. But now it's time for a heart-to-heart conversation with Robin McGraw. In Inside My Heart, Robin speaks woman to woman, inspiring you to embrace and celebrate the many roles you play and encouraging you to make deliberate choices that lead to a richer, happier, and more meaningful life. She shares with you the life-changing moments of her childhood years, dating and marrying Dr. Phil McGraw, raising two sons, and asserting herself as a woman in a man's world to show you that you have the power to make choices in your life. In fact, she's convinced that you must choose to go after the life you want. 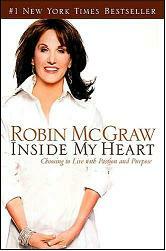 With a deep and abiding faith in God, Robin McGraw shares her story so you too can make choices that reflect your own heart's truest priorities and highest goals.